The State of Washington has designated the highway between, Clarkston and Ilwaco, an official Lewis and Clark Trail Highway. Markers, as adopted by the Federal Lewis and Clark Trail Commission, have been erected intermittently along the entire route by the Washington State Department of Transportation. As you follow the "Trail Highway" from Clarkston to the mouth of the Columbia, you'll experience the contrast in nature. Part of the "Trail Highway" includes the Columbia River Gorge National Scenic Area, which slices 80 miles through the Cascade Mountains. "Beacon Rock"-Second largest monolith in the World! Clark remarks about the "Beaten Rock" while proceeding down river to view potential rapids, 1805. "a remarkable high detached rock Stands in a bottom on the Stard. Side near the lower point of this island on the Stard. 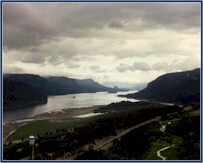 Side about 800 feet high and 400 paces around, we call the Beaten rock"
Lewis remarks about "Beacon Rock" proceeding up the Columbia in 1806.
" this remarkable rock which stands on the North shore of the river is unconnected with the hills and rises to the hight of seven hundred feet; it has some pine or reather fir timber on it's northern side, the southern is a precipice of it's whole hight. it rises to a very sharp point and is visible for 20 miles below the river"